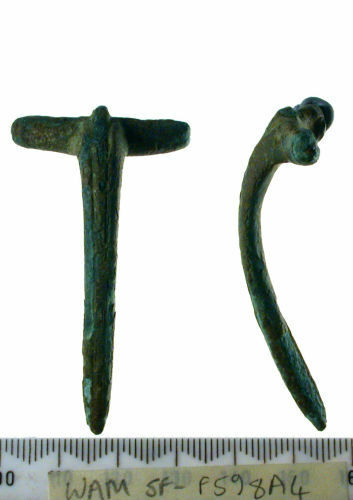 Copper alloy brooch, Colchester derivative / Polden Hill variant type. Missing spring, pin, rear hook, catchplate; very corroded surfaces. The spring axis bar was held by 7mm wide flaps folded around at the wing terminals, with a rear hook taking the chord. The wings have a single groove at the terminals. The bow is oval in section, tapering to a blunt point; two longitudinal grooves are visible along the centre and there may have been decoration in between these. The stub of the catchplate can be seen to be held in a slot in the bow. Width 31mm, length 56mm. Type as West Stow no. 160 (West 1989, EAA 48, 71).